Which Argentine series is it? Seen in Buenos Aires in 1989, I never did find out what category of plate this was. Any ideas? Thanks to Bernt – see Comment below. Because Argentina made its plates so well in years gone by, many survive in excellent condition, as has this San Vicente enamel example from 1929. I found it in a massive old milk factory in which a man named Nestor Corsi made new Ford Model T’s out of original parts which he gathered in from farms all round Uruguay and Argentina. He manufactured anything he couldn’t find, including any style and colour of body, and sold them all to collectors abroad, mostly in USA and Switzerland, he told me. It used to be at least twice a year we would see Argentine cars in London, during the 1960s. Here is a Beetle near Putney, as always in those times, carrying an international oval! 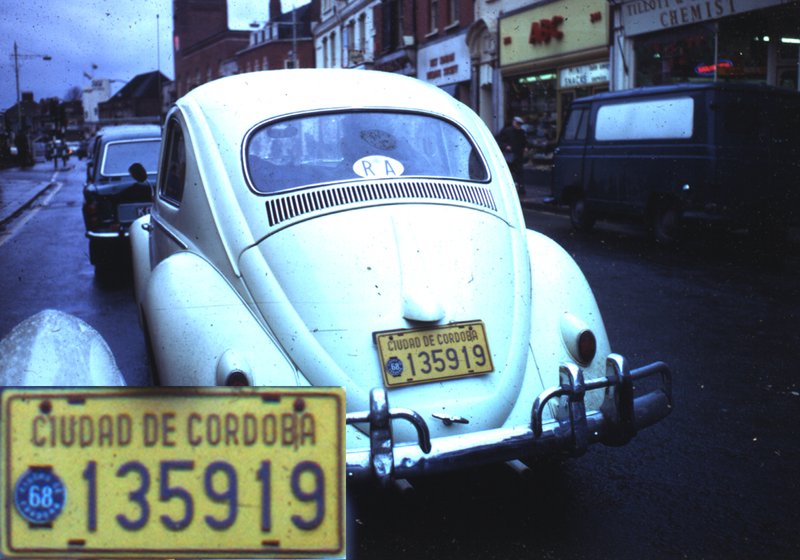 Cordoba-registered VW in London in 1968. And a big American car of the period, from province of Buenos Aires, rather than from the city area. 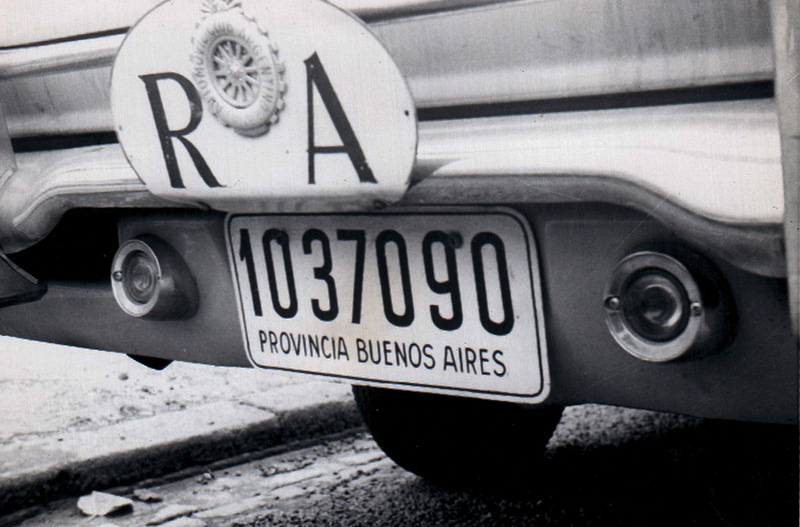 It displays the usual very large RA oval which owners obtained from the Automobile Club of Argentina, as witness their shield. Seen in Kensington, 1960s. This entry was posted on Thursday, September 27th, 2012 at 5:57 pm and is filed under Argentina, Dealer, Historic. You can follow any responses to this entry through the RSS 2.0 feed. You can leave a response, or trackback from your own site. 4 Responses to Which Argentine series is it? Loving the vintage Argentinian pictures,i hava a soft spot for this country due to the large variety of plates to collect.I have one of those red dealer plates in my collection,with a Beunos aires tab affixed,i’d post a picture here,if i could only work out how. Would love to see your RA Trade Plate, Richard. My son Jake has enhanced the structure of the Blog page, to make it more understandable, as I too, can see that it was not clear enough for visitors to make their comments and add articles. 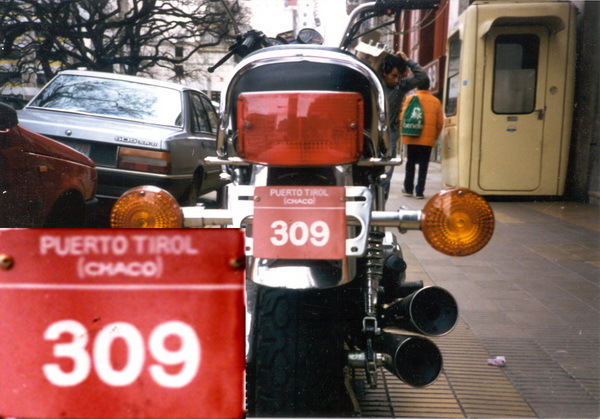 Very interesting pictures – many provinces in Argentina did not issue any official motor cycle plates – they were just handpainted or made according to the wishes of the owner. 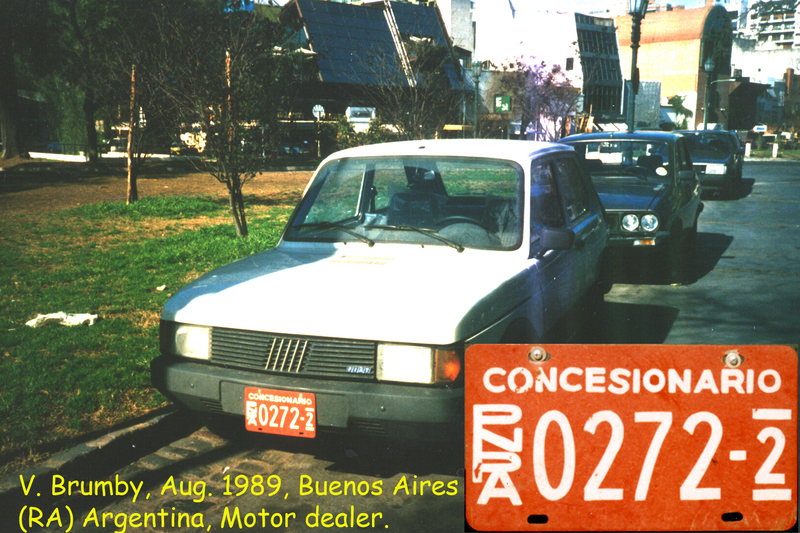 The photo of the dealer plate is extraordinary – it is an excellent contribution to the study on Argentine plates, which I am preparing together with Tomas Rezelj (Bariloche), whose collection of Argentine plates is incredible – any contribution of pictures of plates or car with plates is most welcome. Thanks for the link about the Zapp family. I look forward to those Argentinians with their vintage car coming to Europe (and hopefully Norway) in a few years time. They are now in South Africa, apparently.